As far as Moscow is concerned, the Russian army has completed its pullout from Georgia. On Friday evening, in a meeting shown on Russian TV, the country's defence minister informed President Dmitry Medvedev that the withdrawal of military units had been concluded "according to plan". But according to which plan? The ceasefire agreement brokered by France had called on Russia and Georgia to pull back their forces to positions held on 6 August, before the outbreak of hostilities. Russia, though, says it has the right to maintain a troop presence inside Georgia. 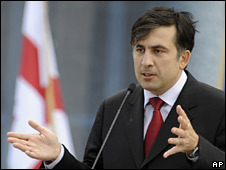 It has created a buffer zone - what it calls an "area of responsibility" - around South Ossetia, which cuts into undisputed Georgian territory. There are reports, too, of Russian soldiers digging in around the commercial port of Poti in western Georgia. The United States and European leaders have criticised Moscow's limited pullout. Some Western politicians would like to see Russia punished, by excluding Moscow from the G8 club of industrialised nations or by preventing Russia from joining the World Trade Organisation. The reality, though, is that there is little that America, Nato or the European Union can do to influence Moscow. The West is not willing to go to war with Russia to defend Georgia. Moscow knows that. Europe relies heavily on Russian oil and gas supplies. Russia is aware of that, too. And the United States needs Russia's help - not only to secure energy supplies - but also to solve the impasse over Iran's nuclear programme and in the area of nuclear non-proliferation. In what has become an increasingly violent geo-political game in Georgia, Russia holds the trump cards. But what does Moscow hope to achieve? 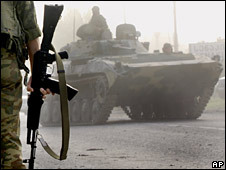 Russia says its "peacekeepers" are sticking around to prevent further bloodshed and to protect the people of South Ossetia and Abkhazia. But Georgia accuses Russia of attacking its sovereignty. Kremlin critics suspect that with its "zone of responsibility", Moscow is trying to increase the pressure on Tbilisi and topple President Mikhail Saakashvili. By keeping troops in Georgia, Russia is also sending an unambiguous message to the West: that the former Soviet republic remains part of Russia's sphere of influence. In recent years, the Kremlin has grown frustrated with what it sees as attempts by the West to gain a foothold in Russia's backyard. It suspects Western governments of having orchestrated Georgia's "Rose Revolution" in 2003 and Ukraine's "Orange Revolution" in 2004, which brought pro-Western governments to power in those countries. Russia has also accused Western intelligence agencies of secretly funding opposition groups inside Russia. It has watched with dismay as Nato has expanded to the Baltic Sea. And Russia is furious that Ukraine and Georgia have been promised that, one day, they will be offered Nato membership. What is more, Moscow views the US missile defence system to be based in Poland and the Czech Republic as a direct threat to its national security. A decade and a half ago, Russia was a weak, impoverished nation, which had lost its empire and was reliant on financial handouts from the West. Today - buoyed by massive oil and gas revenues - Russia feels more confident to flex its muscles, restore lost influence and defend its interests close to home.